This is a code compliant aluminum 60 inch bolt together kit spiral stair. 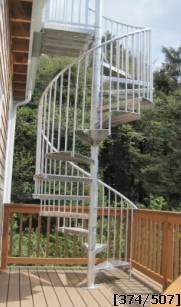 Aluminum spiral staircases are a good choice around saltwater beaches and bays. In industrial locations aluminum spiral stairways will perform well in high moisture areas. Aluminum spiral stairs can be coated. For added protection against oxidation Stairways Inc. Can prime and paint, powder coat or apply an epoxy coating over aluminum. Aluminum spiral stairs are not only avalible in a standard bolt together stair but also in all welded and heavy duty kit models. Contact Stairways Inc for options that will best suit your application.